Home › KnowledgeBase › General support	› How do I delete a quiz? Once a quiz has reached it close date, it will automatically be moved to the Closed quizzes tab. 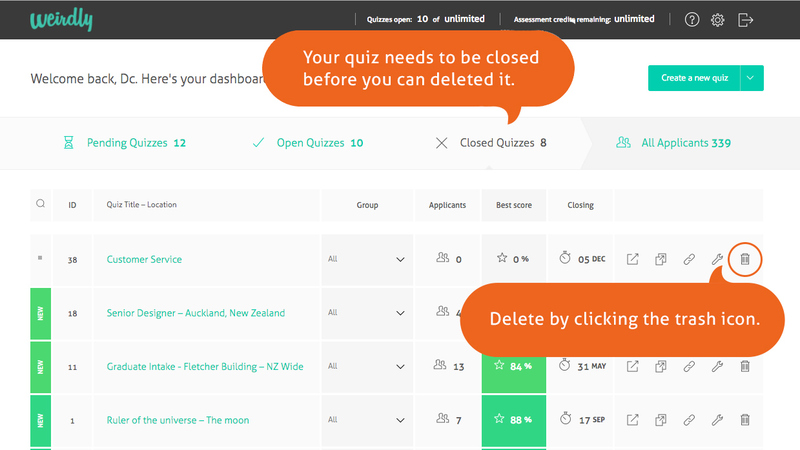 If you would like to permanently delete this quiz, go to the Closed quizzes tab, select the last icon on the right to delete. Only closed quizzes can be deleted. If your Quiz is Open, either drag and drop your quiz to the closed tab, or select the last icon on the right close. If your Quiz is Pending you will need to drag and drop your quiz to the closed tab to then be able to delete it. Or you can select the last right icon to move to Open, then again select the last right icon to move to closed. It can then be deleted by clicking the trash icon. If you are inside your Closed quiz, you can select the trash can icon in the top right. Once a quiz has been deleted it is permanently gone, so please be sure before you go ahead. Applicants that belonged to a deleted quiz can be found under the All Applicants tab.